The new building will have 20 stories (Photo via handout). 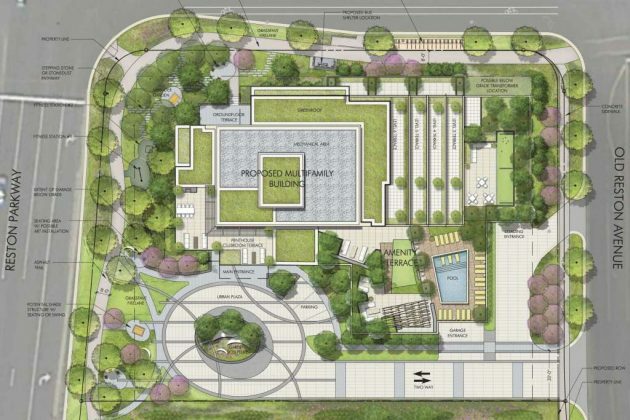 The site plan includes green space (Photo via handout). 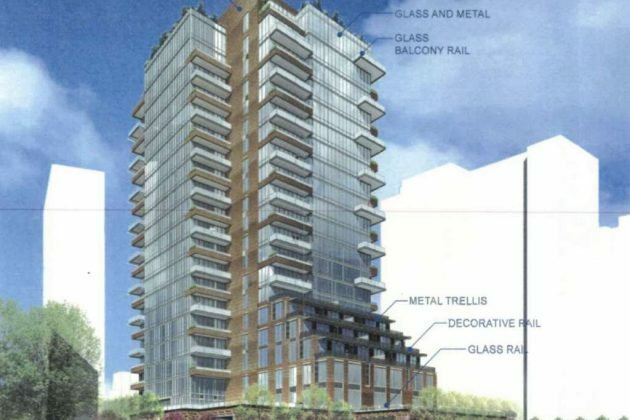 A 20-story condominium high rise will replace a three-story office building built in the late 1980s on 1801 Old Reston Avenue. On Tuesday evening, the Fairfax County Board of Supervisors unanimously approved the project by Renaissance Centro, the developer behind a strip of residential buildings in the area. The project will include 150 residential units, including 24 for-sale, workforce housing units and 24 bonus units, built atop an underground parking garage. 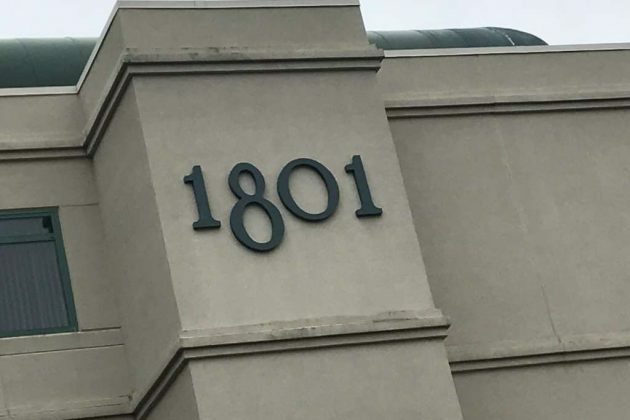 County officials touted the project for bringing for-sale workforce housing on the market — a rarity in Reston despite the prevalence of residential high rises. 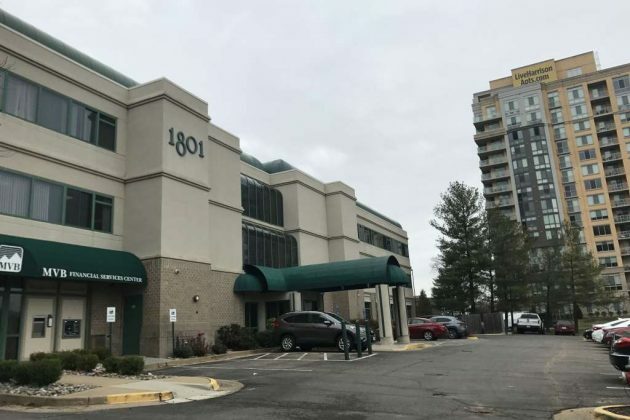 Andrew Painter of Walsh Colluci Lubuley & Walsh, the developer’s representative, said the project is the first for-sale condominium in Reston in 14 years. Painter said Renaissance views the project as a “legacy” development that will transform Reston Parkway from a commuter-cut-through street to an urban parkway. The developer will provide $313,000 for Reston’s road funds and the project is not expected to generate additional traffic compared to the current building, he said. Hunter Mill District Supervisor Cathy Hudgins said the community and the developer worked together to allay concerns. She said the developer is providing green space that will enhance the community space in area on Reston Parkway that serves as an entrance to high density development across from Reston Town Center and at the foot of Metro. As the project moves forward, Hudgins also said traffic improvements on Temporary Road and Reston Parkway are needed. Three residents who testified in support of the project on Tuesday said the project will offer new home ownership opportunities they have awaited for years. One resident opposed the plan because the developer is requesting a waiver for the minimum lot and reduced loading dock requirements. She also questioned why the project’s zoning designation is classified as mixed use, even though the project has no mixed use element. Previously, a decision on the project had previously been deferred. The project will include a pool, an outdoor terrace, a penthouse with terrace space, and an eight-foot-wide asphalt trail. Once built, it will tower above The Harrison and other properties built by Renaissance Centro. “The applicant has a track record of quality development,” Painter said.